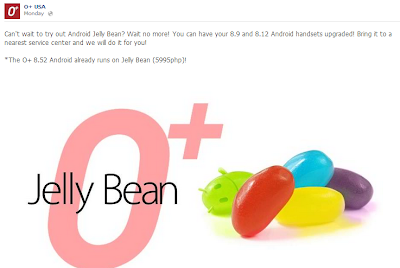 O+ 8.12 and 8.9 Jelly Bean Update Now Available, as Promised by the US Handset Company! One thing I really appreciate about the people behind the American handset company O+ (and the brand as a whole) is that they always mean what they say and they keep their promises. Last December, when O+ released their O+ 8.12 flagship Android smartphone and O+ 8.9 phablet in the Philippines, they said that the handsets will definitely receive a firmware upgrade to Jelly Bean OS sometime in April 2013. And true enough, last Monday, the update finally arrived! If you own either of these phones, you can get Jelly Bean - with all of its smoothness - running on your device by bringing it to an O+ service center and letting their staff upgrade it for you. To know which service center is near you, you can give the company a ring via their hotline numbers: LANDLINE: +632 570 4075, GLOBE: +63 917 824 4121, SMART: +63 999 886 1600, SUN: +63 932 856 1776. O+ Hotline numbers are open Mondays to Fridays 9:00 AM to 6:30 PM and on Saturdays: 9:00 AM – 4:00 PM. Now, for those who are busy and have no time to bring their smartphones to an O+ service center, you may opt to just wait for the over-the-air Jelly Bean update, which you should also get soon. Quoting O+, "We understand your concern about the update. This is for those who are willing to go to the Service Centers to have their handsets updated. You still have the option of waiting for the OTA update, which we are finalizing. Logically and practically it's much faster to have the updates faster on a physical location and with the help of our knowledgeable technicians, thus the service center option came first prior the OTA update." They added, "Please take note that there are things we have to consider and battery of tests to do prior the update so it would be seamless and less problematic for 'You' our users. For those asking why their phone could not be upgraded, your phones' may not meet the hardware requirement of the said update and may cause problems. Thank you." Thanks for keeping your word, O+! We appreciate it!